Please be advised that this item is a toy telescope only! You will have hours of fun looking at nature's wondrous sights for many years with this 42mm Objective Lens Telescope with Tripod. 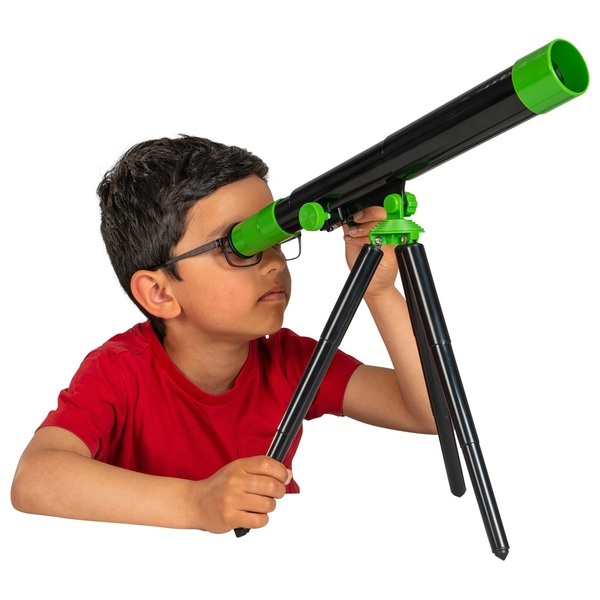 Please be advised that this item is a toy telescope only! You can use your telescope as a terrestrial (land) telescope to study birds, animals and landscapes at a distance. To obtain the best performance from your new telescope, please read the manual carefully and completely. This will open you to a world of possibilities and exploration. 1. Practice-Practice setting up you telescope when you are indoors and have lots of light. Then take your telescope outside. Viewing objects through closed or open windows is not recommended. Let your telescope adjust to the outside temperature as sudden changes in temperature can cause the lens to fog up. 2. Pick the right spot-choose the darkest spot available with the widest view of the sky you can find, moon-less nights are best for viewing the night sky a moonlight washes out deep-sky objects. Put the telescope on a flat surface. 3. Remember to focus- Sometimes focus is hard to achieve especially at the higher magnifications or when viewing conditions are not ideal. When this is the case the best way to focus is to slowly adjust the focuser knob until you have just passed best focus, then back up to the best focus. EU Warning: Not suitable for children under the age of 3 years due to small parts which could cause a choking hazard. Do not view sun with this telescope. Viewing the sun can cause serious eye damage.